Moneyball does what sounds like an impossibility at first pitch: It makes the marriage of baseball and economics a highly entertaining affair. There's a funny little moment that feels like it's going to lead into a great motivational speech by Billy. A "win won for the Gipper" moment, a Rudy scene. But no. He starts off with, "You may not look like a winning team [pregnant pause] but you are one. [pregnant pause] So... Play like one tonight." That's accentuated by a gentle fist pump and an exit through the door. "The problem we're trying to solve is that there are rich teams and there are poor teams, then there's 50 feet of crap, and then there's us." "I hate losing more than I even want to win. And there is a difference." A: "He's a shortstop. He's the shortstop from Seattle." During a news story, Art Howe is given credit for the team's spectacular turnaround. When asked what he thought about that comment, Billy says that what he heard was simply, "I heard seven in a row." Winning trumps the media's detached interpretation. By the way, Howe was a bench coach for the Colorado Rockies back in '95, the team's third season and its first playoff appearance. Based on Michael Lewis’ book of the same title, Moneyball chronicles the 2002 baseball season; it’s a true story about a big idea, an experiment. In the face of the New York Yankees’ luxurious $114 million team payroll, a small market club, the Oakland Athletics, can muster only $40 million. How can a team possibly compete under that daunting discrepancy? Enter Billy Beane (Brad Pitt, Fight Club) and Pete Brand (Jonah Hill, Superbad), the McCartney/Lennon of baseball; they’re going to make their underdog team come together and sing, figuratively, in perfect harmony. During one exhilarating season, they’ll change the way the game is played and they’ll do it on a tight budget. As a movie, Moneyball works on many levels. It has warm characters, quotable dialogue, and a storytelling savvy that digs to the heart of the matter and imbues it with a sensibility that works independent of one’s baseball enthusiasm or lack thereof. Screenwriters Aaron Sorkin (The Social Network) and Steven Zaillian (Schindler’s List) don’t go for the Rocky Balboa hallelujah workout moment; baseball and boxing are two different beasts. Instead, Moneyball follows the same lyrical beauty of another baseball classic, The Natural, swapping out Caleb Deschanel’s masterful cinematography with that of today’s rising impresario of imagery, Wally Pfister (the Oscar-winning cinematographer of Inception). Players’ statistical data wizzes across the screen with all the covert secrecy of a spy thriller; team standings are presented with an ominous sense of gloom as those in the bleachers call out for Billy’s head on a platter when the season starts with a sputter. 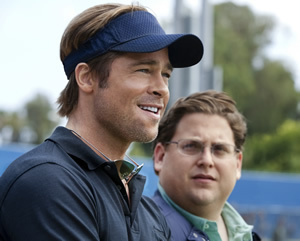 As trite as it might sound, Moneyball isn’t so much a baseball movie as it is a people movie. This is the kind of material that should be mandatory viewing for anyone interested in moving into management, or those who otherwise need to figure out a way to get people working off the same page. For his part, Jonah Hill has never been better than in this, his most mature role after spending too much time in skanky comedies. But it’s Pitt who’s batting cleanup and he’s totally disarming as Billy; there’s a warmth surrounding his character that feeds into his relationships with his smart, talented young daughter, Pete, and the players. Those relationships organically infuse the rest of the production with a quiet, sure-handed sense of telling a good story. There’s a quiet self-doubt on display via flashbacks to Billy’s days as a rookie with the New York Mutts, err… Mets followed by a stint with the minor league Tidewater Tides (now the Norfolk Tides), then a return to the majors with the Minnesota Twins and the Oakland Athletics. Those scenes help flesh out the notion of being a rising star with high expectations that aren’t met. Billy was pulled into the major leagues fresh out of high school; money was a motivator in his not pursuing a college career in return for the immediate gratification of a tempting salary. He lived to regret it and vowed to never let money drive him that way again. In short, he was the perfect guy in the perfect place at the perfect time to seize on Pete’s analytical spin on a player’s true worth. The team’s goal needs to be taken in 90-foot increments. Get men on base. The rest will fall into place. In telling this story, Michael Lewis and Billy Beane have effectively unleashed the genie in the bottle. It’s like Coca-Cola posting on the Internet the formula for its world-renowned soda. In other words, the New York Yankees still have the large bank account, but they can also put into practice the principles of Moneyball. They can now easily take advantage of the best of both worlds, the big-ticket, name-brand players and the obscure, stat-strong players.